Welcome bonus of 10,000 Etihad Guest Miles – one of the highest of any travel card in the Middle East! 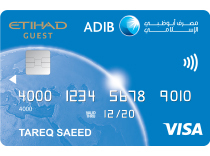 Pay your ADIB Etihad Guest Covered Card Annual fees using 12,500 Etihad Guest Miles (click here to pay). Redeem your Etihad Guest Miles for Travel Bookings, Home Furnishing, Electronics and Gifts for family & friends. Click here​ to redeem your Etihad Guest Miles. As a welcome bonus, you will receive 10,000 Etihad Guest Miles – enough for a return trip from Abu Dhabi to Bahrain, Riyadh, Doha, Dammam, Kuwait, or Muscat. Every purchase you make with your ADIB Etihad Guest Classic Card you will earn up to 1 Etihad Guest Miles for every AED 4 spent (to a maximum of 100,000 Miles per month). That means every transaction brings benefits. What’s more, with the unique “Miles plus Cash” feature of Etihad Guest, you can travel to any destination on the Etihad Airways network. (15) For ADIB Etihad Guest Self-funded Card, ADIB Etihad Guest Classic Card Annual fees is AED 200, ADIB Etihad Guest Gold Card is AED 350 and ADIB Etihad Guest Visa Platinum Card is AED 700.